I've said it before but it's worth repeating - some mornings just call for pancakes. In this case, however, there's no need to feel guilty. These can actually be considered "good-for you." This recipe was another collaboration with Max (Max's Best Bootcamp). I won't lie, it was a lot of trial and error before I came up with a combination that would get Max's seal of approval and meet my taste standards. Let's just say Renato ate many short stacks before he too gave them a thumbs up. It was a tough job but someone had to do it. Since these dairy-free, paleo friendly pancakes are packed with protein, that means they are really filling. They are the perfect fuel to start your day, any day of the week. And I mean, after all, they are pancakes, so they're sure to put a smile on your face even on a Monday. Preheat a griddle pan over medium high heat. In a blender combine the strawberries, lemon juice and honey. Puree until smooth. Set aside. In a medium bowl whisk together the eggs, coconut milk and vanilla. In a separate bowl whisk the protein powder, baking powder, cinnamon, nutmeg and salt. Pour the dry ingredients into the wet ingredients. Stir until well combined. Be sure to break up any lumps. Grease up your griddle with a pat of butter or a spoonful of coconut oil. In batches, using a ladle, spoon some of the batter onto the griddle. When bubbles begin to form on the top of the pancake, flip and let cook another minute. 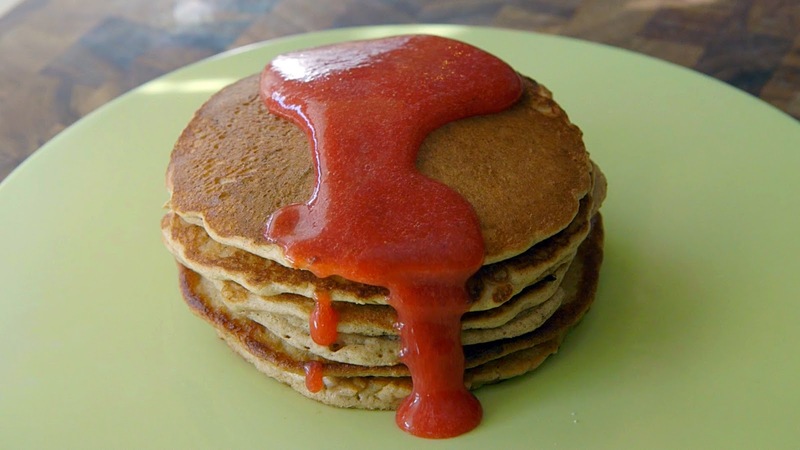 Serve warm topped with strawberry sauce instead of syrup. Interesting, I never would have thought of using just protein powder! I can't speak for all the protein powders out there, but Max's Protein Powder works well in baking as long as you play with the proportions. Some days absolutely require pancakes! I like how you packed yours with protein for a bit of a boost! Nice! I wonder if almond butter might go well in this! another recipe I must try! that strawberry sauces sounds amazing.